Background: Authorities differ on the origins of this name, for some derive it from the town of Gray in Haute Saone in France, while others aver that it originates as a 'by-name' for a person of sallow complexion. Whatever origin, the name enjoys widespread use throughout Britain, and Scottish ancestry should not be presumed without evidence of such genealogical of geographical links. In support of the former proposal, a 'de Gray' of Norman descent, is recorded in Roxburghshire during the 13th century whose descendants, by adherence to King Robert Bruce, gained lands in the Carse of Gowrie. Although other lands were possessed by the family it was here that they held most influence. Their continued support of the Crown enhanced their wealth and, in 1437, Gray of Fowlis was created a peer of Parliament as Lord Gray. The Master of Gray, eldest son of the 6th Lord, and a favourite of James VI, was the go-between acting for King James and Queen Elizabeth during Queen Mary's imprisonment in England. This family were Hereditary Sheriffs of Forfarshire and built substantial properties including Broughty Castle (14th cent. ), Castle Huntly (15th cent.) and Kinfauns, near Perth, in 1822. Castle Huntly, sold to the Lyons in 1615, returned to the Grays in 1777. Grays also held the lands of Carntyne, Glasgow, and others had lands in Ayrshire. North of Inverness, the Grays of Skibo, Sordell and Ardinsh, are said to descend from a son of a Laird of Fowlis who fled thence after murdering the Constable of Dundee and, by these holdings, some Grays are considered 'septs' of the Clan Sutherland. The Highlands names of Glas(s) and MacGlashan are equated with Gray, - the latter being common in Atholl, where it is linked with the Stewarts of Ballechin, of whom a younger son on renouncing his name after a family feud, took the name MacGlashan. Despite family ties to the Stewarts of Atholl his descendants appear to have allied with the Clan Donnachaidh (Robertsons). Many MacGlashans, on migration to the Lowlands, changed their name to Gray. Arms: Gules, a lion rampant within a bordure engrailed Argent (Gray), overall a label of two points Or, each point charged gyronny of eight Or and Sable (Campbell). Crest: An anchor in pale Or. Supporters: Two lions guardant Gules, each charged about its neck with a label as in the arms. View the Heraldry Dictionary for help. The surname is originally French, being first borne by Fulbert, Great Chamberlain of Robert, Duke of Normandy, who granted him the castle and lands of Croy or Gray in Picardy which he thereafter assumed as the family surname. His daughter, Arlotta, is said to have been the mother of William the Conqueror. In England several families from this source were raised to high rank, and spelt their name Grey. From the Dukes of Suffolk came the amiable and accomplished Lady Jane Grey, who was an innocent victim of the ambitions of her father. She was proclaimed Queen of England and reigned for nine days in 1553, but she perished on the block in February 1554. In Scotland, John de Gray was a witness to donations in favour of the Monastery of Coldstream during the reign of Alexander III. He was descended from Lord Grey of Chillingham in Northumberland, and became steward to the Earls of March. Like many others, the Grays swore fealty to Edward I of England in the Ragman Roll of 1296, but they were soon following Robert the Bruce on the long fight for Scottish independence. Sir Andrew Gray was one of the first to scale the rock of Edinburgh Castle when it was taken from the English in 1312. He was rewarded with several grants of land, including Longforgen in Perthshire, for his services to the Crown. One of his descendants, another Sir Andrew, was one of the Scottish nobles who met James I at Durham from his return from captivity in England. He was created Lord Gray in 1444. Patrick, Master of Gray, son of the second Lord Gray, was a Gentleman of the Bedchamber to James II, and when the king stabbed the Earl of Douglas, Gray struck the next blow with a battleaxe. His son, the third Lord Gray, became Lord Justice General of Scotland in 1506. Patrick Gray of Butter-gask, the fifth Lord, was taken prisoner at the Battle of Solway Moss in 1542, and was ransomed for £500 sterling. He was one of the first promoters of the Reformation in Scotland, and in 1567 joined in the defence of the infant James VI. Patrick, Master of Gray, the seventh Lord, was a great favourite of James VI but became embroiled in the intrigues of the time, including the death of the kings mother, Mary, Queen of Scots. He was eventually tried for treason but on the intercession of the Earl of Huntly and Lord Hamilton his life was spared and he was exiled. Andrew, eighth Lord Gray, was lieutenant of the Gens DArmes in France under Lord Gordon. He was ordered to be banished from the kingdom by Order of the Estates for being with the Marquess of Montrose in 1645, but the sentence was never carried out. In 1649 he was excommunicated by the General Assembly of the Church of Scotland for his Catholicism. In 1639 Lord Gray resigned his honours to Charles I and obtained a new patent in favour, after himself, of his daughter Ann who had married William Gray, younger of Pittendrum. William, like the rest of the family, was a staunch royalist, and he commanded a regiment, which he had raised mostly at his own expense, at the Battle of Worcester in 1651. He was killed in a duel by the Earl of Southesk in 1660. For a time the title passed to the Earls of Moray, but on the death in 1895 of the fourteenth Earl of Moray and eighteenth Lord Gray, the title passed to his niece, Eveleen, Baroness Gray in her own right. The present Lord Gray is barred from the chiefship of his family by a famous decision of the Court of the Lord Lyon in 1950  the case of Gray Petitioner, which established that in Scots heraldic law the bearing of a compound, or double-barrelled name, was an absolute bar to assuming the chiefship of a Scottish clan or family. Name Variations: Gray, Grey, Groy, Grays, Graye. One or more of the following publications has been referenced for this article. The General Armory; Sir Bernard Burke - 1842. A Handbook of Mottoes; C.N. Elvin - 1860. Scottish Clans and Tartans; Neil Grant - 2000. Scottish Clan and Family Encyclopedia; George Way of Plean and Romilly Squire - 1994. Scottish Clans and Tartans; Ian Grimble - 1973. World Tartans; Iain Zaczek - 2001. Clans and Families of Scotland; Alexander Fulton - 1991. 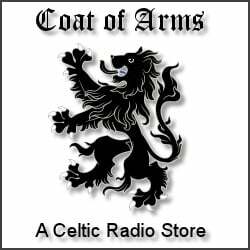 The beautiful heraldry artwork for this family is available to purchase on select products from the Celtic Radio Store. We look forward to filling your order! family heraldry service and much more!